Macedonia (Republic of Macedonia, FYROM) is situated on the Balkan Peninsula, in South East of Europe. The country covers an area of 25,333 km² and its population compromises of 2.01 million people. The official language is Macedonian. 99.6 % of the educational institutions are public and 0.4 % are private. Primary Education is compulsory and generally free of charge, but students still pay for their books and meals in school. Secondary Education has recently become compulsory. Pupils that have reached six years are allowed to go to school. Students who graduate have to make the National External Exams at the end of their four year secondary education. There are 180 state-funded kindergartens in Macedonia and they offer their services to 25000 children (11% of all children who are eligible to attend a kindergarten). Activities in kindergartens are organized in smaller or larger groups, depending on the age and development of children. There are roughly 1100 schools. Almost all of these schools are public. The size of school classes varies from 25 to 34 students. Formal grades are not allowed in the first few years of primary school. The country does not oblige children to take any leaving exams during the last year of primary school. 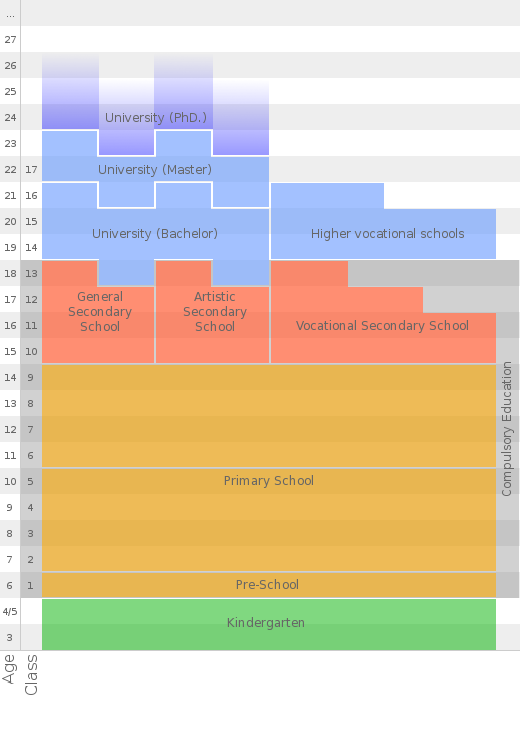 Furthermore, the majority of primary schools have a computer lab with 10-15 computers. Some schools make use of school uniforms. No school meals are supplied. There are roughly 110 schools. About 100 of these are public. The others are private or religious. Students can choose their own school. The grading system used in Macedonia consists of a five point scale. 1 is the worst possible grade, 5 the best. An average school day consists of 7 lessons. One lesson lasts 45 minutes in most of the schools. School students attend lessons in two shifts (morning or afternoon). The possibilities for students to pick their own subjects are very limited. A few vocational schools have entrance exams and all schools have a leaving exam. Furthermore, the majority of secondary schools have no computer labs available to students, apart from during ICT. Most schools have uniforms. School meals are not provided. There are Youth clubs in each school formed by USM and there are Student councils as a part of the clubs where students organize their extraordinary activities. The classes are attended in Macedonian and there is a possibility Albanian students to attend the classes separately in their mother tongue. There are 3 public and 5 private universities. Also, there is one private college in Macedonia. If there are more students than places, entry exams are organised. Disabled students get an education in 45 special primary and 4 special secondary schools. In many regular primary schools there are disabled students learning in separate classes. Secondary education does not provide this option. Programs integrating disabled and regular students have been set up. •	The Law of Secondary Compulsory Education will attempt to offer equal opportunities to all young people. •	Implementation of National external Exams should evaluate the students’ knowledge, teachers’ teaching and whole educational system.